It was sometime around 9:30 pm on December 31st, 2002, when this site first went online. Which means today we're celebrating our fifth anniversary!! FIVE YEARS!! Like I said, WOO HOO!! Well, anyway, it's been fun, folks--and I'm sure it'll continue to be so for years and years to come! True, postings here on site aren't uploaded with the maniacal fervor they once were--and admittedly, a lot of what turns up these days could be categorized as blatant self-promotion (have you, ahem, checked out my eBay auctions lately?... ), but you'll have to forgive me. Two sobering realizations hit me in 2007--the best way to make money off the interned is having something to sell, as the "sitting back and waiting for generous contributions from readers captivated by my witty prose" simply wasn't working (but that's not meant to serve as any sort of guilt trip, friends--truth is, I'VE never tipped a website in my life, either); and as much as some people might enjoy that aforementioned witty prose, what people REALLY want to see from me is cartooning! So, there's been a decided uptick in that department in 2007, with even more planned on the horizon for 2008! Like I said, we've sure morphed into plugola central, haven't we? Sorry--I just feel I should post that cover on the blog at least once every month--at least, until it actually hits store shelves(approximately six weeks from now--oh boy oh boy OH BOY!!). So anyway, thanks to all my regular readers (and to all my irregular ones as well!...) --I truly appreciate your interest. I know t here's a LOT to look at on the 'Net--and we don't even have any new fangled flash animation or video clips--so my sincere thanks to those of you who choose to spend a few moments of you day here from time to time! 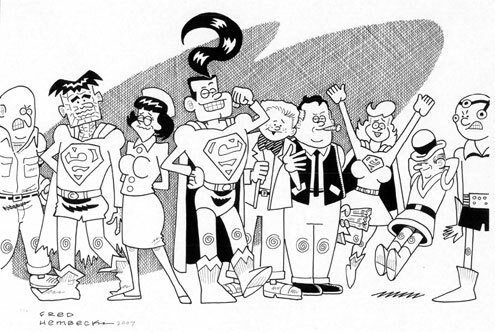 About a month before Christmas, Debbie Franklin--whose husband, Todd, maintains Neato Coolville, a visually sumptuous blog celebrating all sorts of pop culture ephemera from the last several decades--contacted me about the possibility of producing a drawing of ROM and his lady friend, Starshine, as a gift that she could surprise her hubby with. I wrote back immediately with all the particulars, and awaited her reply. Inasmuch as the clock was ticking, I fully expected to hear from her soon. Finally, a week later, she sends essentially the very same note as she had earlier, prefacing it with a few lines apologizing for taking up my valuable time again with her repeated request! Copying over my original reply with my own addendum added, I sent it off--and again, nothing! So, I opened up my rarely used aol email account, and sent off the info to her via that route. Subsequently, I did up the illo, Debbie made like Santa with it, and good ol' Todd has posted it on his website--and you can see it by going here!! 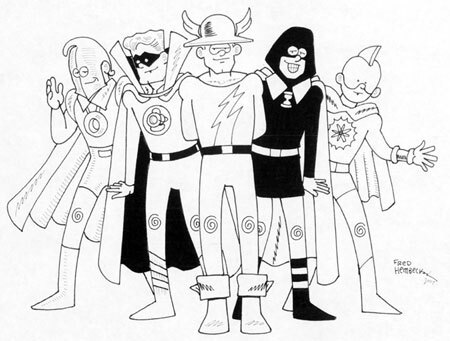 And while we're finding Hembeck art creeping into other corners of the ever expanding Internet, how about this piece of redone Mike Sekowsky art from the legendary first meeting of the Justice League and the Justice Society, drawn in tandem with Bill Anderson and presented in full color on the back cover of a 1981 issue of THE COMIC READER, #197? (And if you click the art, it gets bigger!). 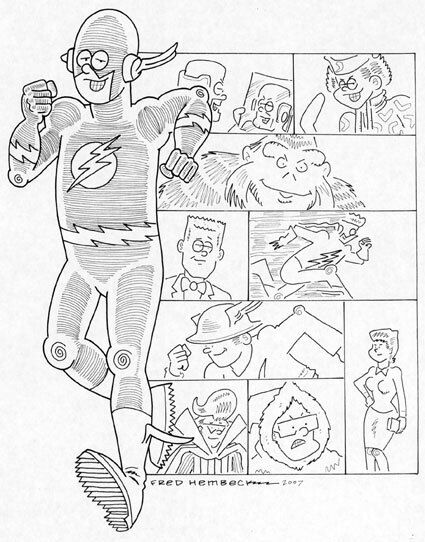 A fellow by the name of Damian Maffei has posted it on his Atom Archives webpage, a site dedicated to DC's Mighty Mite. 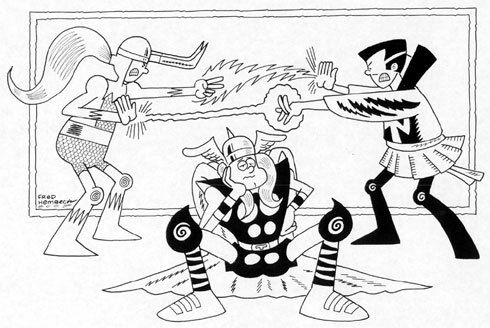 This is a piece of art you will NOT see in the upcoming NEARLY COMPLETE ESSENTIAL HEMBECK ARCHIVES OMNIBUS, mainly because until Damian sent me a note alerting me to the fact that he had posted it, I'd totally forgotten that I ever did it!! As I sifted through the files while putting the OMNIBUS together, the original was nowhere to be seen (I likely just gave it to Bill way back when...), and though I do own a copy of that TCR, it just never occurred to me I had contributed anything to that particular issue. So, anyway, here it is--thanks for sharing, Damian, and I hope your focus on the little guy is a big success!! Lastly, in our little link-o-rama, here's one that has nothing to do with me (at least, not specifically), but is still well worth your time--as long as you don't mind a sobering look the comics fields' hiring practices. 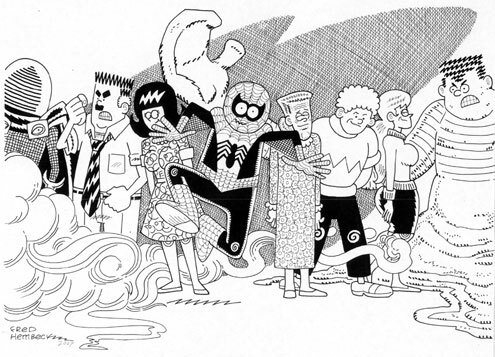 Called "Ageism and Discrimination In Comic Books...or, Whatever Happened To Frank Springer" by Daniel Best, you should also make a point of checking out the comments section after finishing the main article. Yeah, it's a bummer, I know, but it was still something I felt needed pointing out. Hey, it's not all squiggles and light around here, ya know! Come back soon and watch me grow ever older as Cartoon Fred's curly-cues remain as twisted as ever! Just call me Dorian Hembeck!! My mother was an only child, and all but one of my dad's half dozen siblings--an older sister who took up residence in New Jersey, that we only saw rarely--lived their entire lives in their native Germany. Meaning, I grew up without the luxury of having a "cool" uncle as part of my family. You know the kind I mean--the sort of adult who'd yack effortlessly with kids on their own level, never once talking down to them while straining to appear "with it"? One who could joke as easily with an eight year old as he could with folks his own age? The kind of adult who REALLY seemed like he got you? No, I was never fortunate enough to have that sort of blood relation in my life. But on a cold winter afternoon back in 1962, when I was nine years old, I suddenly found myself introduced to the next best (and who knows, maybe even better!) thing. That's when I picked up a copy of FANTASTIC FOUR #4 and first "met" Stan Lee! For the next several years--and especially those first initial few--I truly felt Stan was speaking directly to ME! 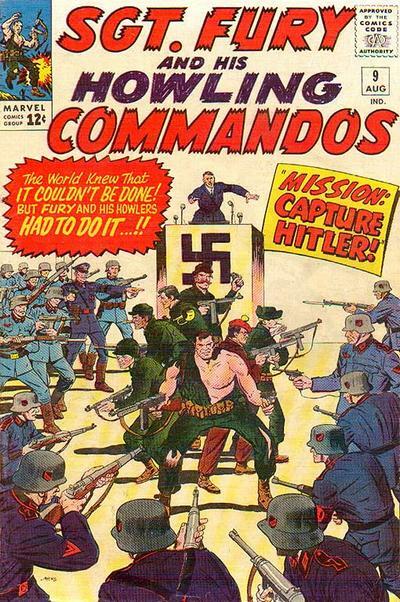 Not to take anything away from any of the talented artists who helped launch The Marvel Age of Comics--or the colorful characters or even the delightful stories themselves--but it was Stan's up close and personal editorial persona--found in the various letters columns, on the bombastic (but somehow still self-effacing) cover blurbs, or even in his yarn's many footnotes--that truly sealed the deal for me. 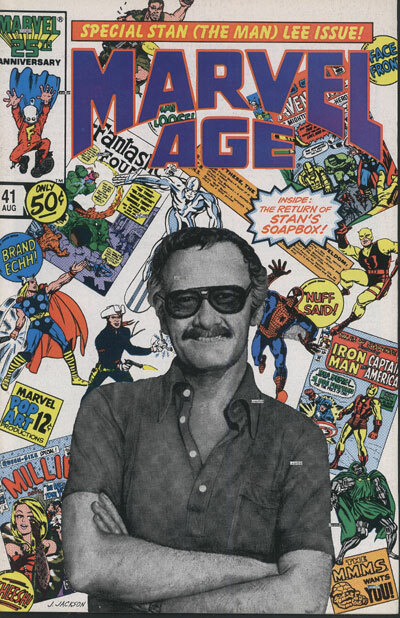 Stan Lee wasn't just the guy who wrote this kid's favorite comic book stories, Stan Lee was this ten-year old's best (and maybe only) adult friend! And so, from that point on, I've pretty much considered Stan an honorary member of the Hembeck clan! And y'know, to this day, I STILL think you're the coolest adult I know!! And if you were lucky enough to receive some always desirable Christmas cash that you just plain don't know what to do with, well, might I humbly suggest you consider purchasing one (or more!) of the following pieces of genuine original Hembeck art? Seeing as how eBay offered a special on ten cent listings again today, I've posted pretty much everything that's currently available, and you can find each of the above auctions--as well as a whole lot more--merely by utilizing this link! Several days ago, I intimated that this year, I was having a little bit of trouble getting into the holiday spirit. That, however, was before I went out shopping last Friday. Friends, I found the true meaning of Christmas at the Dollar Store! Or more specifically, on a handful of cheap DVDs, each featuring a trio of half-century old episodes of now apparently public domain TV shows, some well known, others otherwise long forgotten. For who couldn't find the true meaning of Christmas in newspaper columnist Peter Lawford's attempts (encouraged by perennially cranky editor, Charles Lane) to reunite eight year old George "Foghorn" Winslow, with the father that had run out on his family four years earlier--and who returned wearing a Santa suit--Jesse White, in "Dear Phoebe"? Or Charles Ruggles and his family inviting a young girl they deemed less fortunate to spend Christmas with them on "The Ruggles", only to discover that she may've been the richest one of all? Or Ray Bolger's niece wishing her uncle could be every single person in the world on "Where's Raymond? ", leading to an elaborate fantasy that climaxed with Bolger performing a dazzling dance number dressed as a wind-up toy, marred only by the, um, unfortunate make-up choice to do the bit in black face? Or Jackie Coogan conning kindly old Lloyd Corrigan into collecting money as a street-corner Santa for a non-existent charity on "Racket Squad", money the duped old man eventually used to buy presents for all the poor children in his building, which was his original motivation for taking the job--and, through some creatively sentimental reasoning, was what ultimately prevented the police captain from having to arrest Santa Claus on Christmas Eve? Or Joe Friday's quest to find a missing statue of the Baby Jesus from a local church in time for Christmas Mass only scant hours later on "Dragnet"? Now THAT'S Christmas cheer, huh? Probably the funniest implied suicide in sitcom history I'm thinking! Have a great day, everyone--and careful with those firearms!! 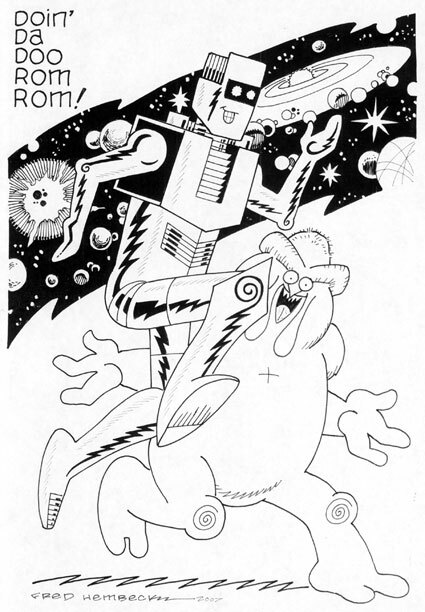 The above drawing of Rom (and his Dire Wraith dance partner) is currently up for sale on eBay--but, I hasten to add, it's NOT one of my own seemingly endless auctions. 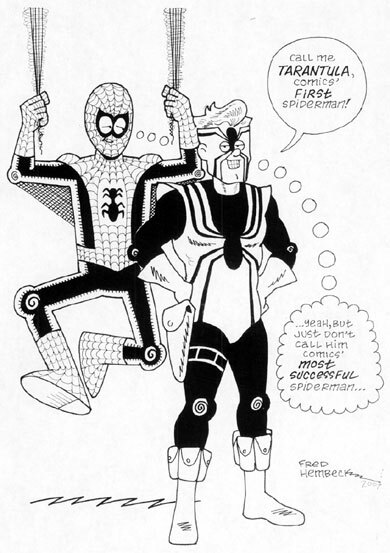 No, this one is but a small portion of the art that's currently available as part of a fund raiser thrown to provide financial aid for the ongoing medical needs of Bill Mantlo, the scribe who wrote every issue of ROM--and, at one time or another, nearly every other title Marvel published--before a tragic accident incapacitated him a decade and a half back. Floating World Comics are the folks behind this worthy cause, and you can read more details--as well as see all the other art currently up for auction--by going here. Hope you all enjoyed the shortest day of the year. Me? Well, I was out finishing my holiday shopping as the night crept in ever so much earlier than usual. Truth is, though I generally dig the season, this time around, I've had a hard time getting particularly enthusiastic about Christmas. Why, I couldn't even muster up enough glad tidings to post any new additions to my "The Many, Many, Many, Many, Many, Many, Many, Many, Many, Many, Many, Many, Many, Many, MANY Faces Of Santa Claus" feature--but that doesn't mean that you shouldn't go take a peek! It's a holiday tradition--and after all, what's a holiday without its traditions? Why, I didn't even begin my non-stop Christmas tune assault until December 12th--which is about two weeks later than usual. My wife and daughter were delighted at my restraint, and I've gotta admit, even I'M usually sick of my Christmas CDs by the time the big day finally arrives! Maybe for once, this year that won't be the case. Hey, if I don't quite get around to that Floyd Cramer holiday disc, life will likely still go on, y'know? Well, no Grinching over here, honest, just a bit of an unusually laid-back approach to the holidays. Whatever YOUR preferred approach is this go-round, on behalf of Lynn, Julie, and myself, I'd like to wish you all the very happiest of holidays--WHICHEVER holiday it is you choose to celebrate, natch! 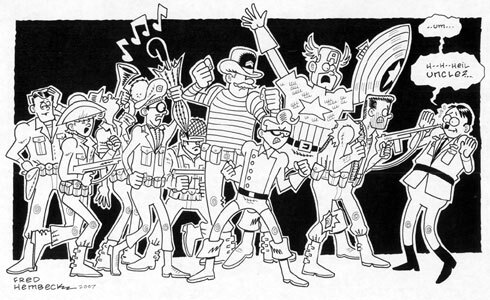 Anyhoo, you can check out the entire monolog--24 Cartoon Freds in all, so be prepared--by following the above link on over to Quick Stop Entertainment..
No, I''m not talking about Santa, I'm talking about Shakespeare! Yup, this past weekend, our daughter's school mounted their latest annual Bard-authored production, this year choosing the ever popular "Romeo and Juliet" for the audience's entertainment--and as always, the students did a remarkable job bringing it to life! Bravo! Lynn and I drove to the school, where we later met our very own personal Romeo and Juliet (minus all the messy tragedy, happily), offspring Julie and her boy friend Alec. Yup, our little girl now has a regular gentlemen caller--and in fact, that evening marked the anniversary of their second month as a couple! (It ALSO marked the one month anniversary of my requesting Alec as my friend on MySpace, which I pointedly mentioned every single time Julie brought up the whole second anniversary thing, saying it was our--mine and Alec's--anniversary as well! Sure enough, she reacted with mock annoyance each and every time I repeated that little fact--ha! 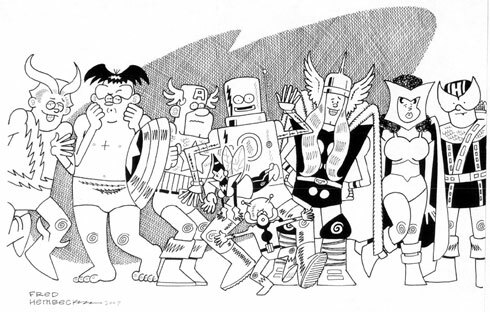 Anyway, midway through the evening, at intermission, who should I spy sitting several rows back but Herb Trimpe and his bride, Patricia (Mrs. T's daughter, Natalia, was cast as Lady Capulet, and as always, she did herself--and her mom--proud!). I hadn't seen Herb for several months, so we did our best to catch up before the lights dimmed again. Seems as if Herb's been making the rounds of the convention circuit in recent months, and having a total blast doing it! I told him if only I wasn't so spooked by the whole notion of flying, I'd gladly accompany him on his worldwide goodwill tour! Soon enough, though, it was time to get back to Shakespeare. What did I think of the play? Well, it reminded me an awful lot of my favorite musical, "West Side Story", only without all the singing. God's honest truth, though--I'd NEVER seen any production of this exceedingly famous play before! So, yeah, while I knew the two leads weren't gonna make it to the final curtain without taking their own personal final curtains first (there's even a prologue that gives away the show's ending right off the bat, I was surprised to learn), what I didn't know about were the rather contrived plot machinations that hinged the piece's denouement on a (yes) wacky mix-up! I just assumed the two kids offed themselves, plain and simple--I didn't realize that the Friar had a "clever" plan whereby he gave Juliet a potion that'd simulate death for several days, just long enough time for her to duck out of her family's arranged marriage to a dude named Paris, waking up in time to run off with her one true love, Romeo. Good plan? Well, maybe--but it sure woulda been a whole lot better if someone had TOLD Romeo about it!! Oh, I know--they TRIED to get a letter to him in time, but well, you can just imagine how THAT bit of business worked out!! My kingdom for a Blackberry! So he visits her tomb, thinks she's dead, and--bottom's up!--downs some fast-acting poison. Moments later, she wakes up from her little venture into suspended animation, finds the (you should pardon the expression) stiff body of her boy toy, takes his dagger and (again, pardon the expression) thrusts it deep, all too soon joining her expired lover on the other side! AND--as the program noted--this whole whirlwind romance took place over the period of five short days! Whew--two whole months in, and neither Alec nor Julie have dipped into the poison pouch yet! Apparently, teen-agers WERE crazier back in ol' Willy the Shake's days! On a purely personal note, while there were plenty of well known lines emanating from "Romeo and Juliet" that even a culturally deprived goon like myself instantly recognized (y'know, like that whole "Wherefore art thou" bit?... ), there WAS one that caught me totally off guard. When her nurse goes up to rouse Juliet on her wedding day--and before she realizes her young charge is (coff coff) "dead", she playfully calls Juliet a "slug-a-bed" when she doesn't immediate arise. "Slug-a-bed"? THAT'S a Shakespeare quote? Gee, thought that was just something Lynn came up with thirty years ago when I was too slow in getting my carcass out of bed! And I've been hearing it regularly ever since--hey, who knew my darlin' dear wifey has been reciting Shakespeare these past three decades? A few days back, shortly after posting my most recent sales-saturated blog entry, I received an email from my good buddy, Rocco Nigro, alerting me to the fact that the very next day, the fine folks over at eBay were having one of their all-too-rare twenty cent listing days. For the uninitiated, note that to sell items priced under $50.00, eBay charges $1.20 per listing, and $2.40 for anything $50 and up, so two thin dimes per item is a relative steal. The only catch this time around? Auctions wouldn't qualify--only fixed price items ("Buy It Now!") would receive the bargain treatment. For those of you interested in what's currently available, here's the link to my eBay offerings. Artists do have their favorites, y'know? Look, when I originally sat down to draw this particular illo, hey, I just figured it'd be another modestly priced piece of art to sell through the auspices of eBay, but after I finished it, I liked it so much, the idea of selling it suddenly didn't seem all that appealing to me--and certainly not for a bargain basement price tag! Call me selfish, call me greedy, call me egotistical, but I didn't want to let go of this drawing--not unless I got paid a pretty penny for it, anyway! Since I really didn't care to gamble the $2.40 on skeptical consumers agreeing with me concerning the inflated worth of this illo, I just held it back each time I went, again and again, to the eBay well. THAT I could afford to lose--and to make sure that any potential parting with it with would be sweet sorrow, my "Buy It Now" price was a full four times what I usually ask for something of this sort! Still, I'm thinking, a steal! So, what exactly WAS this brilliant piece of artwork, you may well be wondering by now? 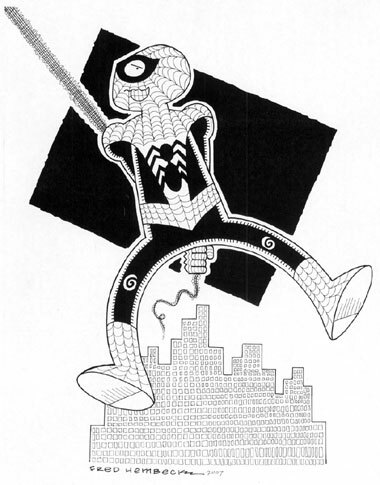 Well, it's yet another example of yours truly mining early Marvel Comics lore and coming up with my own, quasi-fresh take on it. To get a gander at a nearly double-sized image of the above, I beseech thee, go here! Now I know what some of you are thinking: "Huh. That drawing's nothing overly special--what the big deal?". And since art is indeed in the eye of the beholder, you'd be absolutely right. But while I'm still quite a few steps away for petitioning the Louvre for a spot on their wall, what can I say--I was both delighted and surprised at how this one came out! Y'see, most of the time, sitting down with a blank piece of paper, I have a pretty good idea what the finished product will look like even before lifting up my pencil, but not in this case--it was (if I may lapse momentarily into some high-falutin' rhetoric) a journey of artistic discovery every step of the way, from the initial pencilling, all the way through the black-background, a total afterthought added following the completion of all the figures, a notion that really makes the gang pop off the page! Plus, Hitler's getting an up-close-and-personal moustache trim--what's not to like? So, if any of you like it nearly as much as I do, hey, it's gonna cost ya! But if there are steals you're interested in, check the rest of my goodies up for sale--you're bound to find something! Remember how, just last week, I showed you my very own interpretation of the landmark Marvel Age meeting between the mystical might of Dr.Strange and Loki, the Prince of Mischief? Remember? 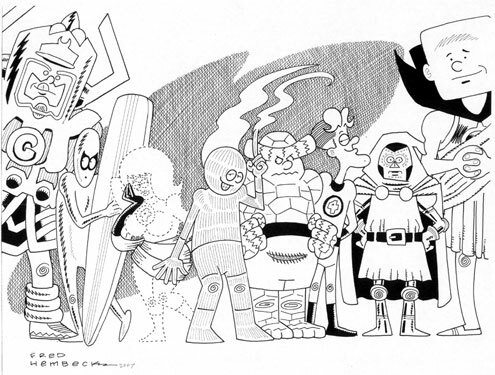 Proving once and for all (as if there was ever any question), I sure ain't no Wally Wood! But if you want a closer peek into those skyscraper windows, go here for a larger image. 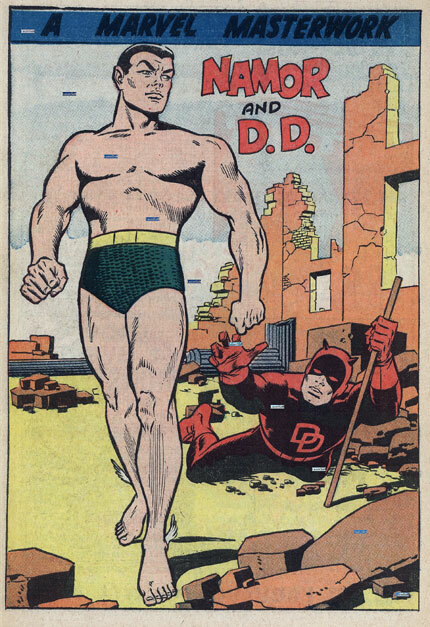 You'd think the Stilt-Man would know better than to go bar-hopping before embarking on a crime spree--geez, watta dope. With one magic mouse click--Shazam!--you can see a bigger version!! 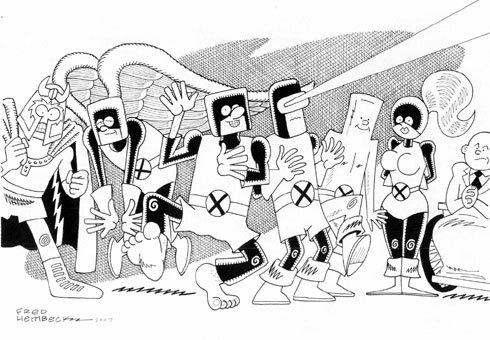 And howsabout our old friends, the original X-Men (not to mention Magneto)? And here's a larger version of same. And for those of you with some cash burning a hole in your pockets, be advised that the eBay auctions are thisaway: DD/Subby; DD and Friends; Shazam Family; X-Men; JSAers; and Hulk vs. Leader! 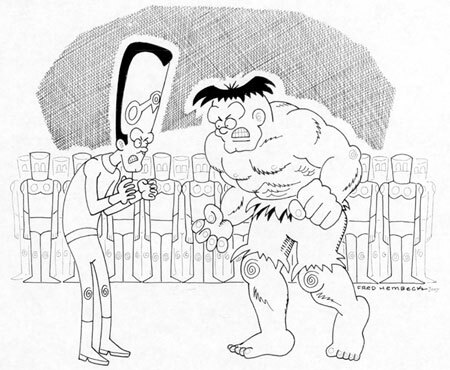 This has been yet another installment of Hembeck's Show and Sell! Thank you for participating, friends, and please come again!! 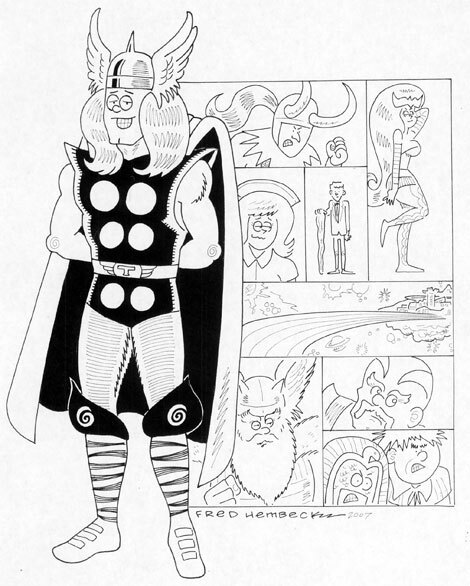 I was wondering if a price for the Hembeck Omnibus with original sketch has been announced. I was going to order from Discount Comic Book Service (they are listing it at 50% off for a pre-order), but was interested in a sketch version if it was in my budget. Either way I can hardly wait for it, I remember reading much of these when they originally hit the stands. Hope you tour the cons this summer too in support of the book!!! I had been planning to hold off on setting a price until I could include the postage fee within the ordering info, and for that, I'd need an actual copy of this massive tome to weigh so as to then match up alongside the various USPS service rates. But I've come to realize that, with the book being offered in Diamond Previews this month, a fair share of potential buyers are going to have to make their decision now as to how to get their hands on a copy. 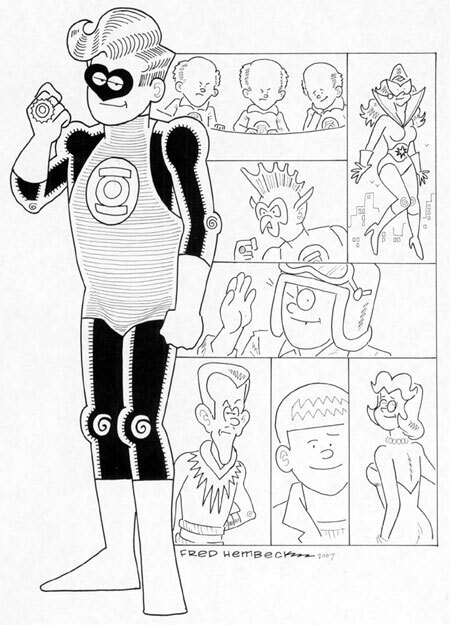 For a copy of The Hembeck Omnibus including a fully inked sketch of the character of your choice (though I reserve the right to request a back-up pick if all of a sudden everyone decides Judge Dredd or Jack of Hearts are the only way to go!) (...but this doesn't rule out the chance for some of you creative types to see my version of your very OWN characters nestled within the collection, as long as I'm provided proper reference!... ), the price is fifty bucks. The book retails for $24.99--toss in another $25.01 (and I hasten to remind you, the as yet undetermined postage fee), and voila!! You'll have yourself a one-of-a-kind object d'art! And these, I hasten to stress, will be fully finished illos, NOT quickly executed marker doodles! 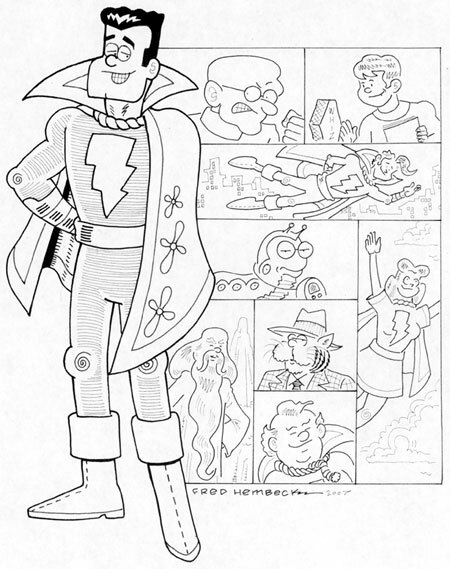 If you don't want to spring for the half C note but still would dig an autograph (as well as kicking a wee bit more of the profits directly my way), I'm happy to offer my John Hembeck--as well as a small Cartoon Fred head--for the modest sum of $25, only one thin penny over retail (not including--say it with me gang--that ever mysterious P&H fee). 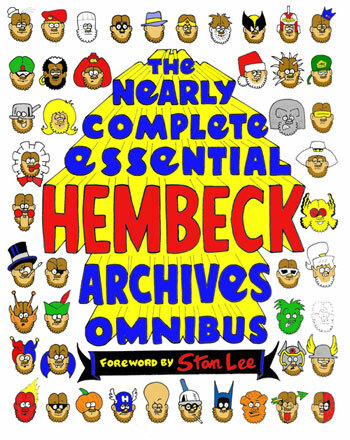 And to those of you anxious to get your copies--for who amongst you would want to be the last on the block to score themselves a Hembeck Omnibus?--I hereby pledge to mail out your personalized volumes in as timely a manner as possible! Still, if like Eric, you can get the thing for $12.50, well, no one loves a bargain more than yours truly, so more power to you I say! Anybody buying the book anywhere for ANY price has ALL of my sincere appreciation, dig? But hey, if any of the above deals appeal to you, keep 'em in mind, and the minute I get ahold of an actual physical copy, I'll make the necessary postage calculations and announce them here! At least now, those of you interested in getting a copy with an illo have a bit of a better idea what it's gonna cost you! Okay, Eric? Thanks for asking--but please, no Ego The Living Planet requests, okay? Ho hum--another day, another Hembeck hype-fest. 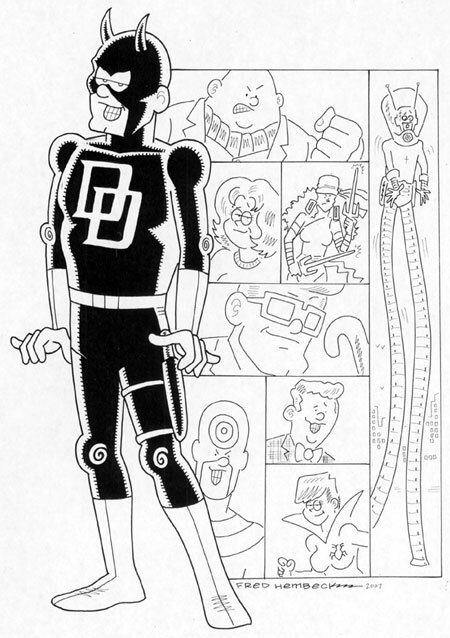 This interview--conducted by Westfield Comics' Roger Ash--actually occurred over the telephone wires as opposed to the email route favored by my two previous Q&A's. Happily, Roger gave me a chance to go over the transcript of our chat and sweeten it a little after the fact, thus making myself sound minimally more articulate. Thanks, Roger--and to Newsarama's Chris Arrant and Publisher's Weekly's Peter Sanderson as well--for all the free publicity! And good news for you folks--for the time being, that should do it for Hembeck interviews! Glory be! "I beseech thee, purchase my tome! Praise Odin!" 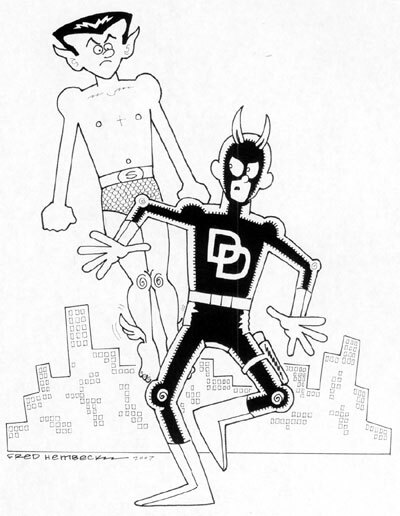 Over at Newsarama, the relentless drumbeat of publicity for the thing called The Nearly Complete Essential Hembeck Archives Omnibus drones on with a short interview with me, Fred "Hard Sell" Hembeck. Those of you who find their eyes rolling back conspicuously at the mere notion of reading yet another puff piece centering around yours truly may want to scroll down through the accompanying comments section to discover a small controversy breaking out amidst all the good cheer. Eventually, I signed up and got onto the forum to offer my own response, resulting in, what? Happy ending? More acrimony? Hey, I ain't telling! You'll just have to go look--I need SOME hook to lure you in, after all! For me, STRANGE TALES #123 from way back in 1964 always conjures up a lot of fond memories, even if, in the final analysis, it's hardly an outstanding comic. As a prime example of the rapidly developing appeal of Marvel's nigh-magical aura though, well, THAT'S something else entirely! 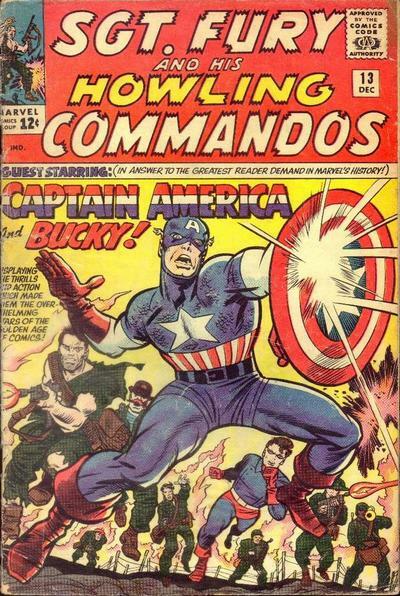 Back when I used to write separate mini-essays here on site to accompany my Classic Cover Redos (ah, those were the days), I waxed poetic about that particular issue--as well as provided my full color version of Jack Kirby's iconic cover--here. Go read that if you need further background (and hey, even if you don't), but today I'm primarily here to share a bit of a new twist on my approach to re-imagining The House of Ideas' halcyon days. 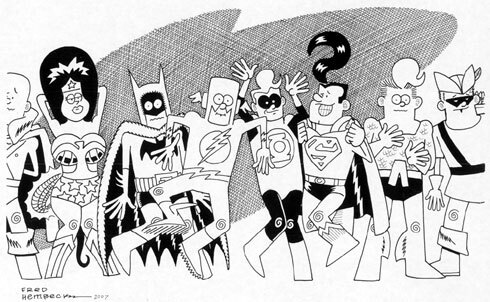 And how can you throw the spotlight on the JLA and then totally ignore The Avengers? Even better view of Ant-Man can be found here. Maximum viewage via this link. 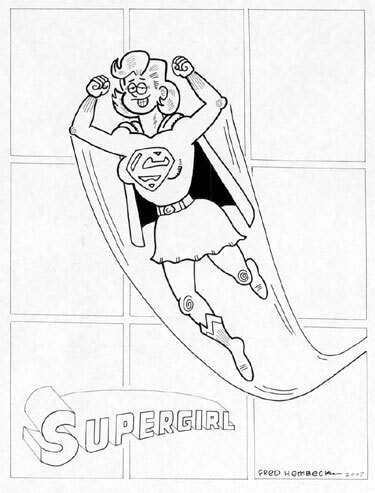 Lastly, bursting off of a strangely blank Silver Age page is Superman's cousin, Kara Zor-El, better known to us all as Supergirl! 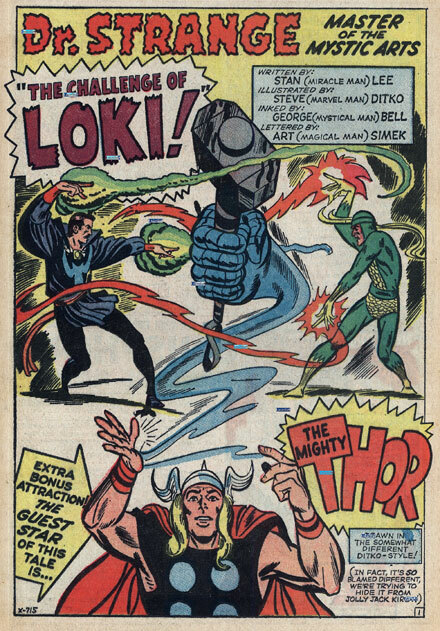 And--you betcha--eBay auctions can be found here: Dr.Strange and Loki; JLA; Avengers; Green Lantern; and Supergirl!